Back cover blurb: What do you do if you witness a crime…but no-one believes you? When Kate sees a horrific attack streamed live on her laptop, she calls the police in a state of shock. But when they arrive, the video has disappeared – and she can’t prove anything. Desperate to be believed, Kate tries to find out who the girl in the video could be – and who attacked her. Freddie and Nas are working on a missing persons case, but the trail has gone cold. When Kate contacts them, they are the only ones to listen and they start to wonder – are the two cases connected? Dark, gripping, and flawlessly paced, Trust Me is the brilliant third novel in the hugely popular social media murderer series. 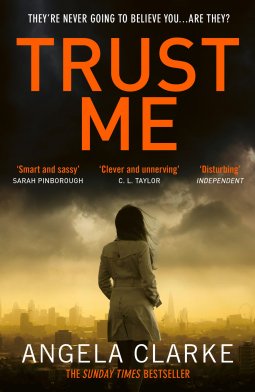 Trust Me is the third novel in Angela Clarke's social media series, and as always this author manages to send a chill down my spine when I consider what could happen to anyone who partakes in social media of any kind on a daily basis. Kate is watching videos being live streamed online when she witnesses a horrific sexual attack on a young girl that culminates in violence. Kate is horrified and does what she considers to be the right thing by reporting the crime to the Police. However by the time the Police arrive, the video has been removed from the internet without a trace left behind. No other witnesses have reported a similar offence and Kate is forced to let the matter lie, shocked that the Police have questioned her own judgement after spotting a glass of wine on her table. She knows what she saw. Luckily Kate has connections to Freddie Venton, a Civilian Police Social Media consultant who alongside DS Nasreen Cudmore are working on a missing persons case that could be connected to local gangs. Could one of the gang members be behind this? Could the missing girl be the girl in the video? Previous readers of this series will know that Freddie's mind, much like her mouth runs at a million miles an hour, and she is admirably keen to help Kate. But as always doesn't put an awful lot of thought into her actions before she carries them out. Inevitably this leads her to trouble, but Freddie isn't afraid of a little trouble if it means getting the Police the right result and the criminals bought to justice. As always Nas is on hand to try and help her friend, but not if it involves breaking the rules. Could Freddie have gone too far this time? If so, just who will be there to back her up when it all goes wrong? Trust Me is available from 15 June 2017.